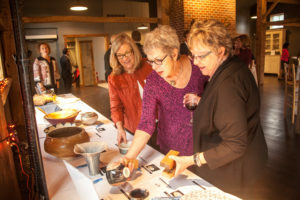 SOS Community Service’s Road to Home fundraiser was a big success! How long has your company been a member of the Ann Arbor/Ypsilanti Regional Chamber? A typical day for The Back Office Studio involves giving individuals, remote workers and entrepreneurs a great place to do meaningful work. We have fast WiFi, conference rooms, phone booths, cafe seating, sit-to-stand desks, private offices, and fresh Hyperion coffee. What do you enjoy most about the A2Y Chamber? The A2Y Chamber is a great way for us to connect with other businesses in the Ypsi and Ann Arbor area. We love the programming and events that the chamber supports. What’s your favorite tip for someone in your industry? You don’t have to work at home or at a noisy coffee shop. We have a great space for you to do your best work in downtown Ypsi. Come join us for a day and see if coworking is good fit for your work. In a recent study of coworkers, 84% report that they are more engaged and motivated, 67% experience improved professional success, and 69% feel more successful. If you would like to be featured in our Member Spotlight,contact us. Beyond Primary Care, a family medicine and addiction medicine clinic has been a member of the Ann Arbor/Ypsilanti Regional Chamber since October 2018. A typical day for Dr. Jeff O’Boyle involves getting out of bed early for a cardio, yoga, or weight work-out (need to do what I myself encourage my patients to do!) followed by a dog walk with my two huskies. Then I make an oatmeal or yogurt parfait breakfast and it is off to the clinic! First I start my day by answering any emails from patients. Then I mix in patient appointments, in-clinic medication refills, in-clinic blood draws, business appointments, and personally following up with my patients over phone, webcam, or text. 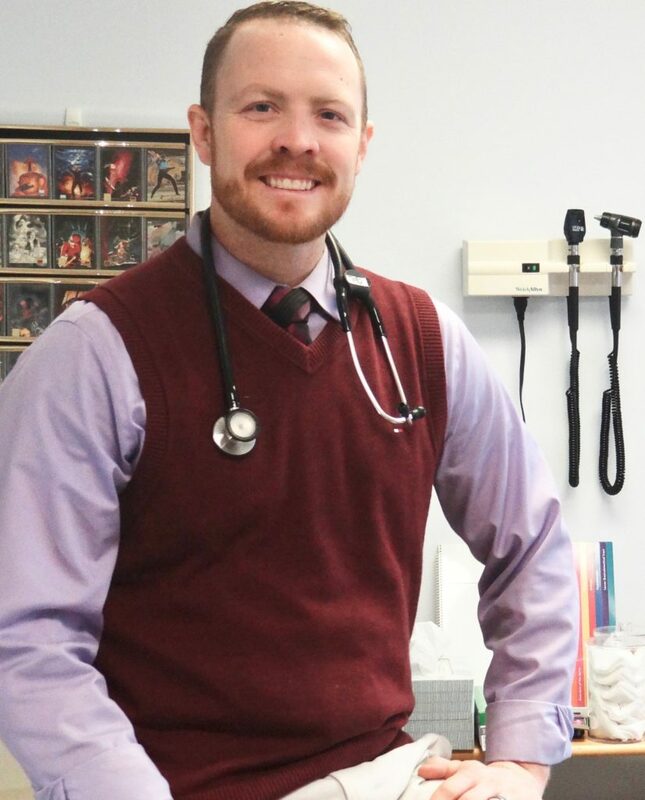 I spend time in coordination of care between my patients and their other healthcare providers, as well as connecting to learn more about other physicians, chiropractors, naturopaths, pharmacists, health coaches, and nutritionalist in the community. In the evening I head home, where making and sitting down for dinner with family is an important daily routine (also encouraging my patients to do the same). As a small business owner, I know that great employees are important to success, and treating them like family helps build loyalty. I know how challenging it is to provide affordable health care for employees. As a physician, I also know that having health insurance does not guarantee healthcare. Through the chamber, I have had the absolute pleasure of meeting and connecting with some of the most genuine people and small business owners one could hope to meet in the community. I listen to the stories and concerns regarding the ever-increasing cost of health insurance and share everyone’s desire for affordable and accessible healthcare. My advice is to keep innovating to add value to your services, never be content to rest on your laurels. At Beyond Primary Care, one way we provide innovation is routinely offering same-day access to appointments with minimal wait times with a dependable physician is who can address more than one concern at a single visit. Beyond Primary Care is a new approach to family medicine that creates the time and space that your health deserves. All appointments at Beyond Primary Care are a minimum 1 hour long. Our patients don’t have to stay that length, but the option is there for them. We love taking care of people who are looking for individualized healthcare, a strong and seamless doctor-patient relationship, and affordable and accessible healthcare that we create through eliminating the unnecessary overhead in the insurance model. kick boxing circuit training, cycling, yoga and barre, and combinations of these concepts under one roof. Red Effect also deploys revolutionary heart-rate monitor technology that creates the ultimate workout. The HIIT workouts are designed to achieve and maintain heart rates in the target zones that stimulate the metabolism, increase energy and achieve an “after-burn” effect that can last up to 36 hours post workout. The infrared heat emitted throughout the Red Effect fitness studio warms the body naturally, which raises core body temperature and enhances the workout to produce a deep, healthy and detoxifying sweat at a cellular level where most toxins reside. Among the many workout benefits of weight loss, conditioning, toning and stress relief, working out in an infrared environment is also known to reduce inflammation, aid in anti-aging and produce overall cardiovascular health. Ann Arbor members will enjoy numerous extra perks at the Ann Arbor Executive Club 10,000-square foot Studio, including unlimited use of infrared saunas, a full schedule of watch and post-game victory parties in the studio’s social lobby, a full service Stretch Smart Infrared Therapy Center and a smoothie bar. We would like to thank everyone who participated in making Road to Home 2018 SOS’s most successful fundraiser to date. 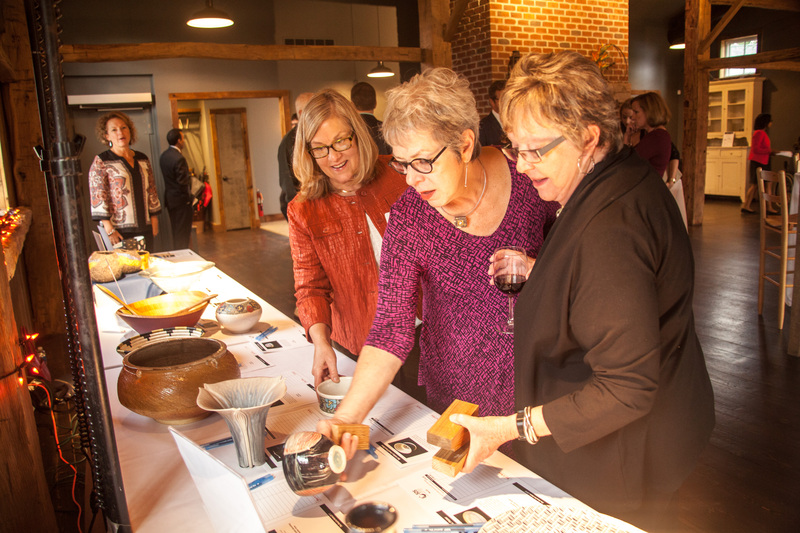 Two hundred guests enjoyed appetizers and a silent auction of artisan bowls at Zingerman’s Greyline on October 4, 2018. 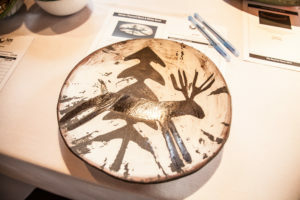 The event raised a record $105,970 this year. 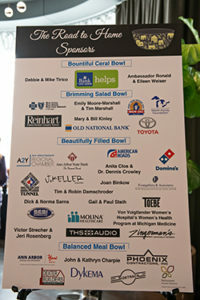 SOS would like to thank the event co-chairs, Emily Moore-Marshall and Tim Marshall, and the event sponsors. 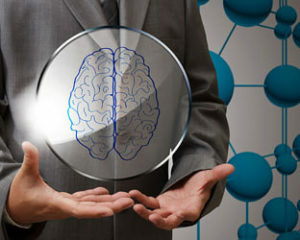 Fred George Sauer and Dr. Judith Lynch-Sauer of SciStress.com provide new, fast, real-time Stress Management for Performance. Join their October 30, workshop in our Boardroom from 9am-11am. Together, we’ll create a blueprint to guide your financial life. 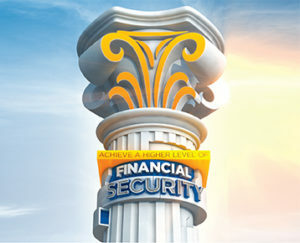 Create your financial plan with Northwestern Mutual. From financial planning to long term care planning and employee and executive benefits, together we’ll design a personalized plan to help you achieve financial security. Who’s helping you build your financial future? 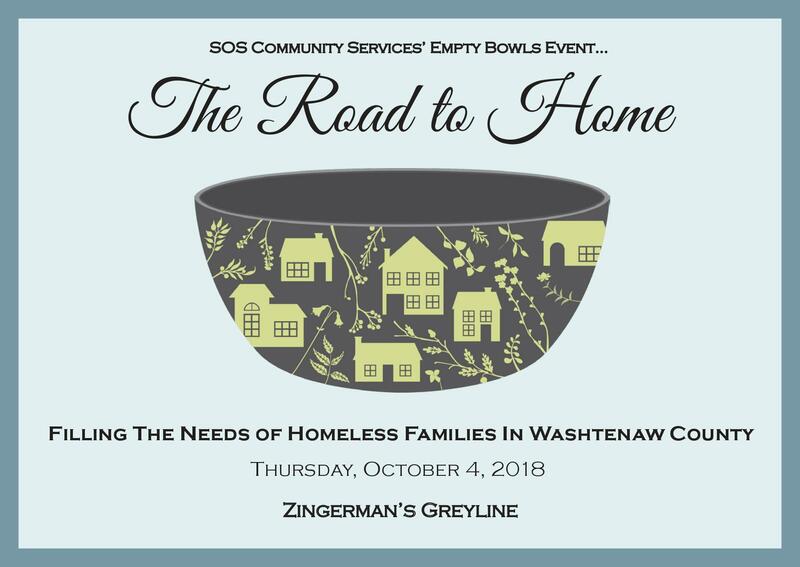 The SOS Road to Home Fundraiser will be held on Thursday, October 4 at Zingerman’s Greyline. The event starts with a one-hour happy hour from 5:30 PM – 6:30 PM, and the main event is from 6:30 PM – 9:00 PM. 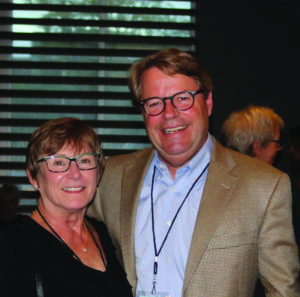 SOS is honored to announce the 2018 Road to Home Fundraiser event chairs are Emily Moore-Marshall and Tim Marshall. 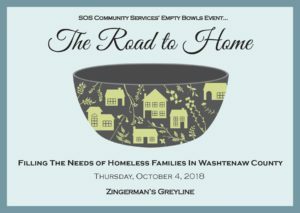 We are excited to have the Marshalls serve in this role, and help raise awareness and funds for at-risk and homeless families in Washtenaw County. materials including glass and ceramic. 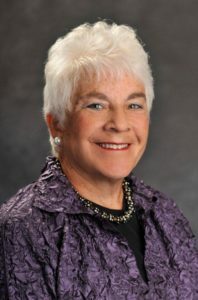 To learn more and purchase tickets visit www.soscs.org. At IHA, we understand the unique healthcare needs of each person. Providing all the care you’ll need – from primary care and specialty care, to 7-day-a-week urgent care services and a 24-hour call center. But most importantly, it’s healthcare your way! Watch three patient stories at IHAcares.com/yourway and see how they access our convenient healthcare tools in their daily routines. 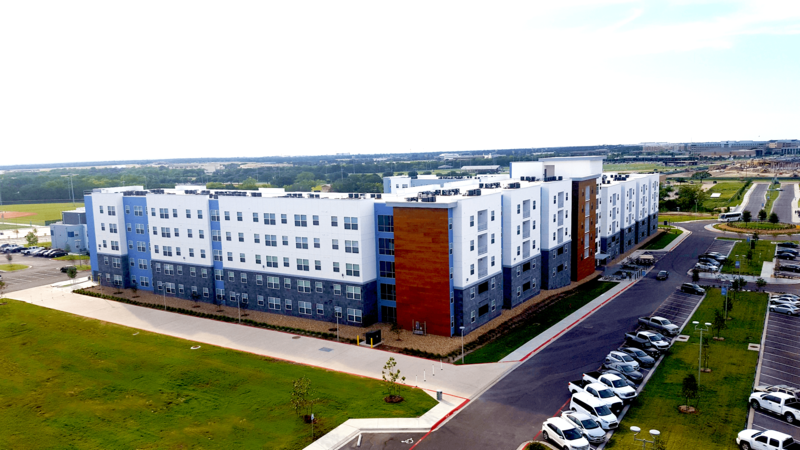 Park West Student Living at Texas A&M University in College Station is the country’s largest ever single-phase student housing project. With 15 buildings across 47 acres, the complex has 3,406 beds among one-, two-, and three-bedroom apartments. The sleek design and amenities – gyms, pools, gaming lounges, jogging trails, convenience stores and coffee shops – make this a first-rate living option for students who attend Texas A&M, one of the largest universities in the United States. Located on the west side of the Texas A&M campus, Park West is just across the street from the famed Texas Aggie Kyle Field. 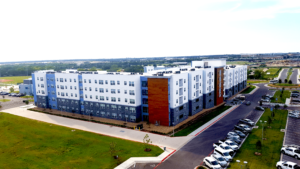 The unique project is the result of a partnership that includes the Texas A&M University System, the National Campus Community Development Corporation, and collegiate housing developer, Servitas. One of the top priorities in developing any residential setting, especially a collegiate student residential complex, is access control. When Synergy Fiber, a recognized leader in managed communications services, was selected by Servitas as the total technology partner during the construction of Park West, Chief Executive Officer Norman Roe knew SALTO Systems was the best access control provider for a project of this size. 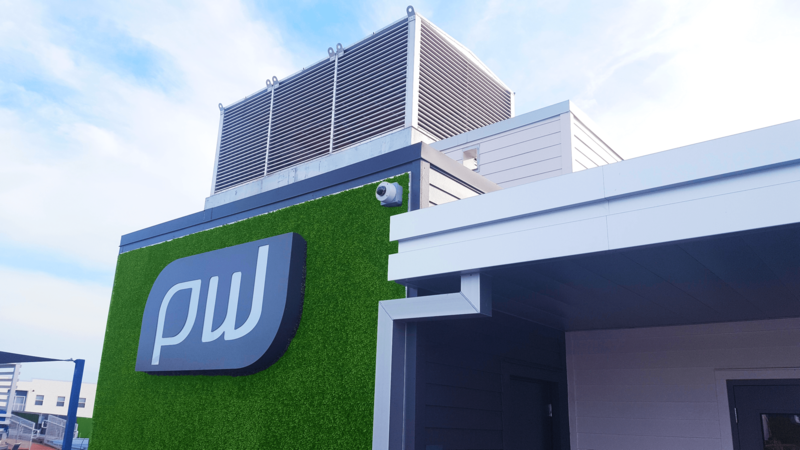 To provide a comprehensive access control security solution for Park West, Roe and his team at Synergy Fiber chose to install SALTO electronic locks, readers and controllers to be managed by SALTO’s ProAccess SPACE software. The property has its own dedicated SALTO server and all controllers (4200 series) are connected to the same local switch network, but are on their own dedicated security V-Lan. Nearly 1,100 doors throughout Park West are outfitted with SALTO’s XS4 offline escutcheons (full body escutcheons with mortise lockset) and 79 online locks. SALTO locks are also being used to protect the property’s datacenter, which hosts its own cloud for the client and server cabinets. SALTO locks also protect and provide audit trail for Park West’s storage units which, at times, can house millions of dollars’ worth of inventory. Synergy Fiber Product Manager Douglas Karaska says SALTO’s revolutionary SALTO Virtual Network (SVN) data-on-card technology improves the ease of use throughout the life of the project, making the transition from development and construction to operational and functional, a smooth one. SALTO’s SVN allows stand-alone locks to read, receive, and write information via an encrypted and secure data-on-card system that utilizes the capabilities of RFID read/write technology. In SVN, all access data is stored on and distributed by its operating smartcard or device. When presenting a credential to an offline stand-alone door, not only does this control access rights to that door but, thanks to two-way communication, the door also writes data – like blacklist information or battery status – back to the smartcard. The smartcard then transmits this information back to the server via online wall readers that update and receive information from the cards anytime and anywhere in the facility. As technology improves and wireless environments grow, data on card technology with SALTO is “more reliable and not subject to RF interference or power and network outages,” adds Synergy Fiber Chief Operating Officer Jenean Kaiser. Synergy Fiber manages door and server maintenance at the complex while Park West’s leasing office manages day-to-day credential assignments for the more than 3,500 residents, employees, and other approved users via SALTO’s ProAccess SPACE software. ProAccess SPACE also offers the convenience of being browser based so no local client is required for use and it’s compatible with common browsers like Chrome and Firefox, he says. The residents have easily adapted to the SALTO solution since the facility opened its doors in August of 2017. They use contactless RFID key fobs or bracelets for entry into the facility, interior bedroom units, and the property’s amenities. For garage entry, windshield stickers are used to obtain access. Roe says SALTO’s access control installation has gone smoothly for the massive residential property, and it is just what he expected. Founded in 2012 by Artistic Director, Jodie Randolph, Pure Existence is a professional contemporary dance company based in Ann Arbor, MI. We are a company that values improvisation and movement exploration, comprised of six highly-trained professional dancers. The company presents two concerts locally each year in addition to serving as guest performers across the country. Aside from presenting compelling dance productions, PE also offers seminars, workshops, master classes, intensives, residencies, open rehearsals, pre/post performance discussions and a growing list of community outreach programs. 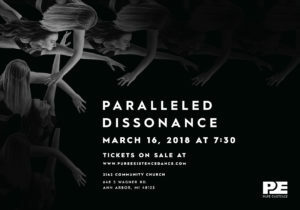 By bringing dance to Ann Arbor and the greater Metro-Detroit area through performance and education, Pure Existence has repeatedly found unique ways to increase accessibility to the art of dance and employ dance artists. As part of our mission, PE is committed to providing opportunities for trained dance artists through paid positions as well as performance and training opportunities for both the experienced and novice dance artist. Additionally, PE aims to help the community connect with dance through workshops and performances. Pure Existence proudly supports and mentors X2, a pre-professional youth dance company comprised of talented artists in the Southeast Michigan area. Pure Existence employs two Artistic Directors and contracts a small group of professional dancers. PE is assisted and operated by a volunteer Board of Directors and a growing Advisory Board. PE is a nonprofit 501c3 organization. 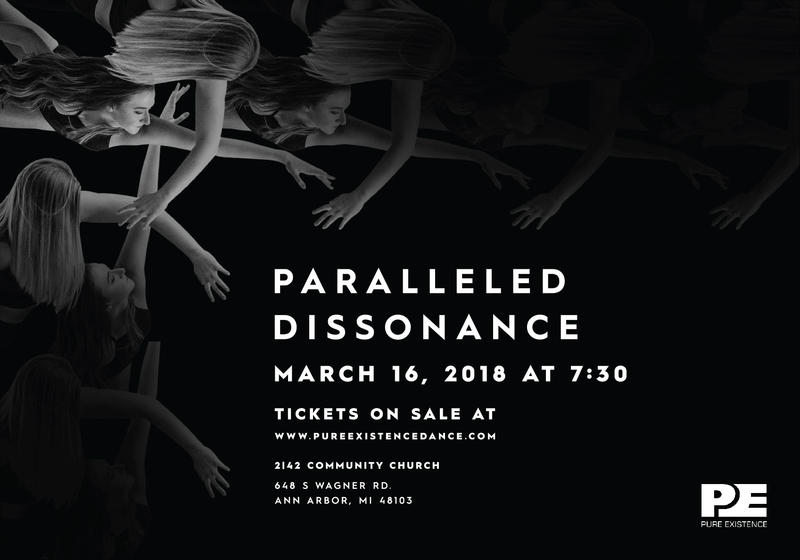 Created, directed, and choreographed by Jodie Randolph, Paralleled Dissonance is an evening-length work developed in collaboration with Pure Existence dancers and original score by Andrew Harness. The work explores the undeniable tensions in our world through the subject of interpersonal conflict. Innate opposition becomes the source of investigation, offering a deep reflection of the polarity within ourselves. Our complicated need for human connection is countered by the wars that ensue between nations, between people, and ultimately within. A contrast between the individual versus the collective questions the boundary between self and other. Question & Answer session immediately following performance!